First Kiss Friday with Kate Moore & a Giveaway! Today on First Kiss Friday, I’m welcoming another author friend of mine from my local chapter of Romance Writers of America. 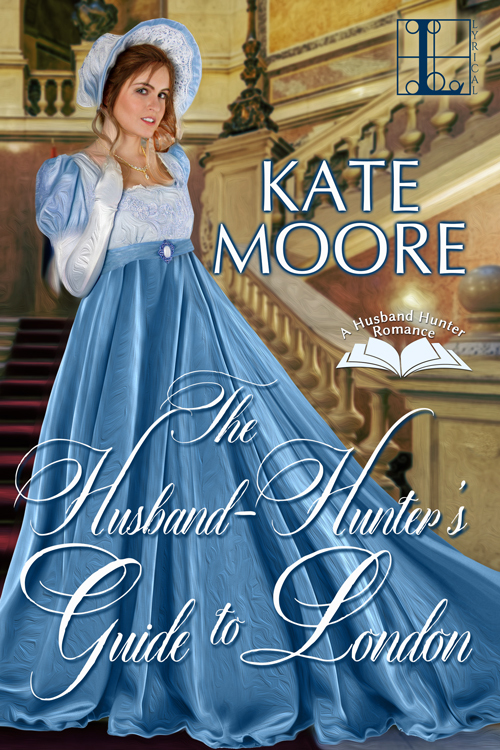 Please help me welcome Kate Moore who will be sharing an excerpt from her novel The Husband Hunter’s Guide to London. Kate is also offering a giveaway of an eBook! Leave her a comment and she’ll choose a random comment as the winner. Happy reading and enjoy! Contrary to what the Husband Hunter might expect this guide to suggest, she must not fall in love. It is no more advantageous to “fall” in love, than to fall from a horse or a bridge or down a flight of steps. The uncontrolled path of a falling object and the inevitable end of a fall in a broken head or broken limbs is no apt metaphor for the onset of deep and lasting affection. Love does not happen to us as a result of chance or a misstep. It is not induced by Cupid’s arrows, nor by the juices of rare flowers applied to one’s eyelids. We may discover that love has begun, or that we are in the midst of love with another person, but not because we have fallen but because, in a fertile garden carefully planted and tended, love has bloomed in its season and place when perhaps we were not looking. Hazelwood handed Jane into the carriage and climbed in after her without speaking. He settled a rug over their legs and feet. The carriage lamps cast a faint light into the cold interior. “Did I?” He knocked against the forward panel for the coachman to start the horses and leaned back against the leather upholstery. The dim light revealed his profile, the straight line of his brow above the deep-set eyes, the plain thrust of his nose, and the faint pull of a smile on his lips. In profile he looked almost ordinary, almost like the sort of man her guide would recommend, a sensible man of good character and respectable reputation. She reminded herself that he was no such thing. . . .
“The situation called for action. That’s what I do. I act. Are you going to tell me what you discovered about the painting?” There was a touch of irritation in his tone. “. . . No damage done. You can see for yourself.” He took her gloved hand in his, slipped it inside his greatcoat, and pressed it against his chest, his warm, hard chest. Through soft wool and silk and linen she could feel the strong beat of his heart. The sudden intimacy altered the smooth rhythm of her pulse. The carriage rattled along over the stones, and under the rug her knee bumped against his thigh. 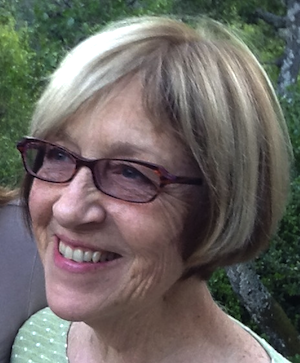 Hazelwood’s other hand slid around the back of her neck and pulled her closer. The wool scarf over her head slipped back. “Yet here you are.” His low voice had that break in it that turned her insides to jelly and made the inches apart seem like too much. His mouth was near but not near enough. It was like the end of a desert journey, when the donkeys stumbled on their feet, and it was dangerous to even think of water. She could not deny the truth of it. Though she had no experience by which to judge, some instinct of which she had been previously unaware told her as much. She had barely tolerated Clive’s patting her hand, yet Hazelwood’s tying her bonnet or tugging at her ribbons drew her whole person to him, like a wave sucked back to the sea. She should lean away from him, but her body refused to move. “You know, I have had suitors before.” She was not as green as he supposed. “Have you?” He pulled the wool garment from around her throat. “How is a fellow to impress a woman of such vast experience, I wonder?” She could hear the laughter in his voice. And felt the change in him when the laughter died. He lowered his head and leaned forward across the narrow space where their breath already mingled in the frigid air. Then he kissed her. At first it was a lazy, teasing kiss, lips meeting in a touch as light and airy as words and wit. It coaxed her along, floating lightly on the tide of their wordless exchange, until she was far out from shore, not anchored any more to the bench of a rocking carriage rolling through London. A deeper current of feeling welled up and knocked her off balance. She clung to him more. He was solid and real. His mouth took firm and unyielding possession of hers. The kiss became a question about who she truly was, the husband hunter she claimed to be, or a daring woman who would put her trust in a stranger who was still a mystery to her yet who seemed to understand her as no one ever had. The dark, rocking coach seemed made for their encounter. He slid so that his body angled down and made a hard slope against which she lay, held in place by his arm around the small of her back and his mouth on hers. Their carriage halted. They had reached the hotel. She scrambled back on to the seat, rearranging her disordered skirts. It was time to break free of the hold he had on her, to remember that she had only one purpose in London, and it was not to find a husband but a father. A native Californian, Kate studied English Lit and taught generations of high school students, who are now her Facebook friends, while she not-so-secretly penned Romances. In Kate’s stories honorable, edgy loners meet warm, practical women who draw them into a circle of love whether in Regency London or contemporary California. A Golden Heart, Golden Crown, Book Buyer’s Best winner and three-time RITA finalist, Kate lives north of San Francisco with her surfer husband, their yellow Lab, a Pack ‘n Play for visiting grandbabies, and miles of crowded bookshelves. Glad you enjoyed Kate’s excerpt! First Kiss Friday and this excerpt made me think of my first kiss. I was in 4th or 5th grade and I was invited to Edgar Kauffman’s birthday lunch. We had Lipton’s Chicken Noodle soup which I had never had before. After lunch the party was over. As I was leaving Edgar leaned forward and KISSED ME ON THE LIPS. It didn’t come close to the excerpts but it was memorable all the same. I’m 71 now but often think about that sweet, sweet kiss. I enjoyed the excerpt. Now I have to read the rest! What a wonderful kiss! And fabulous banter! Now I’m dying for the whole book! Thanks to everyone who’s commented. I wondered whether it might take anyone back to that first kiss–in a car, a closet, the den, or wherever! Good memories I hope! Oh my I loved that kiss! I do not remember my first kiss for some reason. I was really shy and did not date until I was a senior in high school and then not a lot. I do remember the first kiss with my husband though… Love this excerpt and want to read. Love the Husband Hunters Guide advice! I feel like I’ve been waiting for a story like this. Thank you Kate for writing it. Thanks for stopping by and leaving a comment, Mary Kay. Thanks to everyone who left a comment for Kate. We appreciate you stopping by. Kate decided to give away four eBooks to the following people: Lois, Cheryl, Mary Kay, and Lovestoreadandreview!. Congratulations everyone. I’ve given Kate your emails and she will contact you all individually!